Technorati relaunched its site tonight, changing and adding key features. Most notable is an expanded and fresher top 100 blogs list, and a new feature that lets authors post their content directly to the site. In 2007 Technorati redesigned the look and functionality of its home page three times. Here’s the first. And the second. The last change, made under the direction of incoming CEO Richard Jalichandra, has stayed more or less constant since then. In the meantime, Technorati has focused on expanding it’s business in other areas, particularly in handling advertising for other sites. Today, only a small percentage of Technorati’s total network traffic of 25 million U.S. unique visitors per month actually visit Technorati.com. But that doesn’t mean the flagship site isn’t an important asset. And those of us blogging for more than a couple of years can remember the days when Technorati was a key blogging tool, providing, among other things, a high quality real time search engine back when Google only indexed most blogs every few weeks. 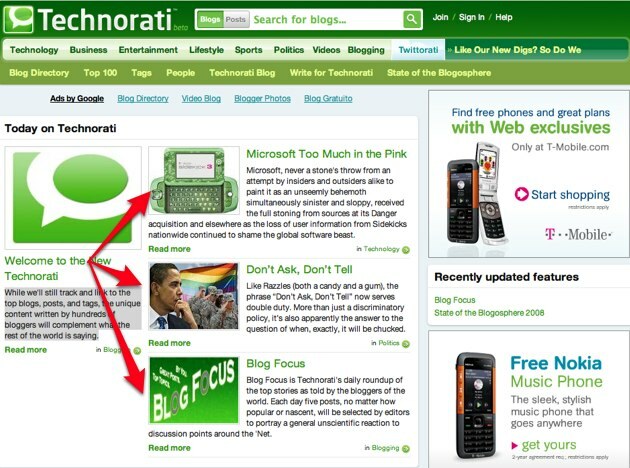 Today Technorati still provides a great blog search engine and keeps what many call the definitive Top 100 list of blogs. With the new site, they are focusing more on direct Technorati content (more on that below), and properly categorizing the more popular blogs. Top 100 Blogs: Until today, the top 100 blogs were determined based on unique links from other blogs during the previous six months. The top list was fairly static. Now they are focusing much more on recent data within the last month and giving blogs an authority rank between 1 – 1,000. Scoring factors include posting frequency, context, linking behavior and “other inputs.” The result, says the company, is a lot more volatility in the lists as blogs surge up and down. Technorati is also categorizing blogs among a variety of topics, and providing separate lists of top blogs for each topic. Here’s Business, for example, and Gadgets. Authors can now choose to publish content directly to Technorati to gain exposure to a wider audience. This content is highlighted on the top of the Technorati.com home page. For bloggers with a big audience this won’t be attractive. But if I was just starting out with blogging, I’d post some of my content here to gain exposure, and then cross post to my own blog. Each writer has a profile with links to their site and content they’ve written on Technorati. Technorati is changing search to give much more weight towards authority and relevance over recency. For highly queried terms like “iPhone,” this cuts out a lot of noise and helps people find quality/definitive content more quickly. Users can also choose to search for blogs relevant to the query or posts elevant to the query, depending on what they are looking for. Technorati still shows outside content on a topical basis, too. The light green navigation bar at the top has topics like “Technology” and “Sports.” Content shown on that channel includes stuff directly written on Technorati as well as posts from blogs with high authority for the topic.